Jurgen Klopp fits Liverpool, and Liverpool fits Jurgen Klopp. But in exactly what way? Jamie Carragher gives his verdict on the pairing, and why he’s not concerned that Klopp is Franz Beckenbauer’s “ideal man” for Bayern Munich. Before Liverpool’s 3-1 win over Bayern Munich last week, which took the Reds to the Champions League quarter-finals, Beckenbauer said that the former Borussia Dortmund coach would be an ideal appointment at Bayern Munich. 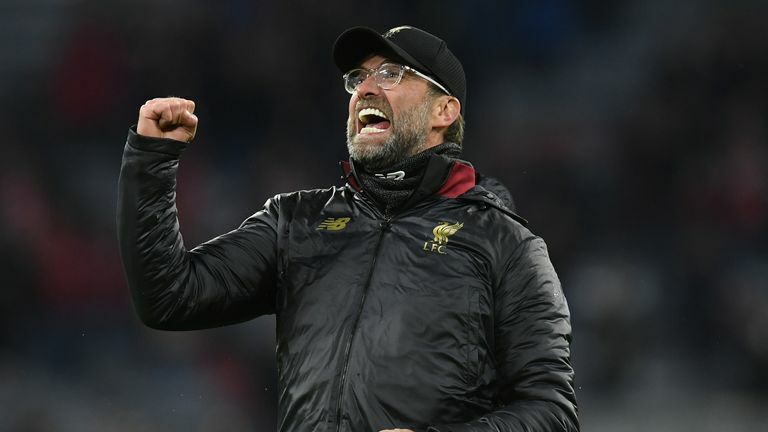 Klopp, who is yet to win a trophy in his three-and-a-half years at Liverpool, reacted by saying he loves working at Liverpool and has to keep proving himself. Sky Sports pundit and former Liverpool defender Carragher says Klopp and Liverpool’s fit goes beyond football, and suggests the German operates best at clubs who are fighting against the ‘elite’. He’s suited firstly because he’s a top manager. There’s no doubt about that. Then there’s his personality, his passion on the sidelines resonates with Liverpool supporters. His beliefs away from football, too, and how he likes his football played. He resonates with fans on a different level. When he speaks, Liverpool supporters listen. He speaks their type of language, how they like football to be played. It comes back to that energy and passion in his team, and with him on the sidelines. That mirrors Liverpool people and Liverpool supporters at Anfield. Liverpool people have just taken to him. How long that love affair lasts? It depends on how successful the club are. There are a lot of top managers in the world. I’m not saying Jurgen Klopp is the best manager in the world, by a long stretch, but what I would say is I don’t think any manager is a better fit for Liverpool than Jurgen Klopp is. It doesn’t really worry me that Franz Beckenbauer says he is the perfect fit for Bayern Munich. Jurgen Klopp has only had three clubs in his managerial career, and none of them have been a Bayern Munich-type club, a Real Madrid or that type of club. He’s always been at clubs where the feeling is you are fighting against those clubs. Maybe that’s what brings out the best in Jurgen Klopp. Of course there is no doubt top clubs around European football will be looking at Klopp to be their manager one day, but he’s at a top club right now for him. He’s had success with similar types of clubs, from that working-class area. It does feel like he clicks with those types of clubs, and long may it continue. [Keeping hold of players] is a big thing that people at the top of the club and Jurgen Klopp have achieved. Liverpool did lose Philippe Coutinho not so long ago, but I think it would be difficult to prise players away from the club now. Of course if Real Madrid and Barcelona come calling for your players, it’s very difficult, because most players anywhere want to play for those two clubs. But I think right now the players absolutely adore Jurgen Klopp and they want to stay part of this journey.